When I was about 8 years old, my dad often give me a coin to play Arcade Machine on sunday. The nearest Arcade Machine near my home was Toki, also know as Juju Densetsu in Japan. I loved this game even if it was very difficult to me. 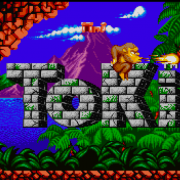 Years later, I trie Toki on Megadrive/Genesis but this version is far away from the Arcade version (too far, crap I mean). Musics are from Yukihiko Kitahara for the Jamma version, the Megadrive version was adapted by Pierre-Eric Loriaux from Ocean French team and he make a great job, but it’s not exactly the same taste to me. Hope you enjoy this piece of my childhood memory . Oh thanks, can’t find who it was after a long search. When typing his name on Google, I find your article about Falcom Sound Team JDK Composers in first page with him in it. Many stages, huge boss and hard to finish, as I love them. Thanks for the comment name.